He set an impressive lap time during the final seconds of the qualifying session on Saturday afternoon and came out on top with team mate Colin securing his place in the top five with James setting the fourteenth quickest time and Warren twenty first. Race one saw Jason take a lights to flag victory and his first race win of the season in his all new Subaru Levorg GT bringing his total wins to a staggering ninety-five. Jason led the race throughout managing to hold off the threatening BMW of Jack Goff who took second place with Colin bringing his Subaru Levorg home in third and taking the final spot of the podium. James brought his car home in a point scoring position of fifteenth but there was dismay for Warren who was tapped into a spin and subsequently forced into retirement from the race. m during a safety car period. Colin endured a race long battle with the BMW’s of Goff and Tordoff and then Jordan. The Honda of Matt Neal passed both Colin and Goff and into third after contact was made between the pair at the hairpin. With 75kgs on board Jason was eventually passed by both Tordoff and Neal and finished in third position having held them of until the final two laps with Colin was just behind in fourth. There was disappointed for both James and Warren who had incidents with James being sent into a spin due to contact but managed to bring his machine home in 21st and Warren was tapped from behind and put into the gravel trap and had to retire from the race for the second time of the day. The Silverline Subaru BMR Racing drivers were lucky in the reverse grid draw for the third and final race of the day with Matt Jackson’s number being drawn from the barrel, promoting Colin up to third and Jason to fourth. James started from 21st and Warren 27th. Colin got a good start retaining his position whilst Jason lost a place to the BMW of Rob Collard on the run down to the first corner. After a brief safety car period allowing the cars to bunch up, Colin was on the attack of the Collard, and the BMW of Goff was in turn on the attack of Colin, bringing yet another Subaru and BMW battle. Then disaster struck when there was contact between Collard and Colin sending them both into a spin and ending their races. Jason then enjoyed a third place battle with the Honda of Scotsman Gordon Shedden but managed to keep him at bay. Jackson took the lead, Tordoff came in second and Jason brought home the Subaru Levorg in third for the final podium spot. James finished in his second point scoring position of the weekend in thirteenth with Warren completing the race in twenty fifth. Rounds 22, 23 and 24 of the 2016 Dunlop MSA British Touring Car Championship take place at Rockingham on 27/28 August, we hope to see you all in the stands. Paul Tunnicliffe, Managing Director of Subaru UK commented: "Another good day's work for the team, with steady progress continuing to be made. I was particularly delighted for Jason, who, in true JP style, marked his 500th BTCC race with a pole, and a lights to flag victory. Colin continues to show gritty determination, carrying out crucial overtaking manoeuvres to keeps his title hopes alive. Personally, I wouldn't bet against us being there or thereabouts come Brands Hatch. Roll on Rockingham." 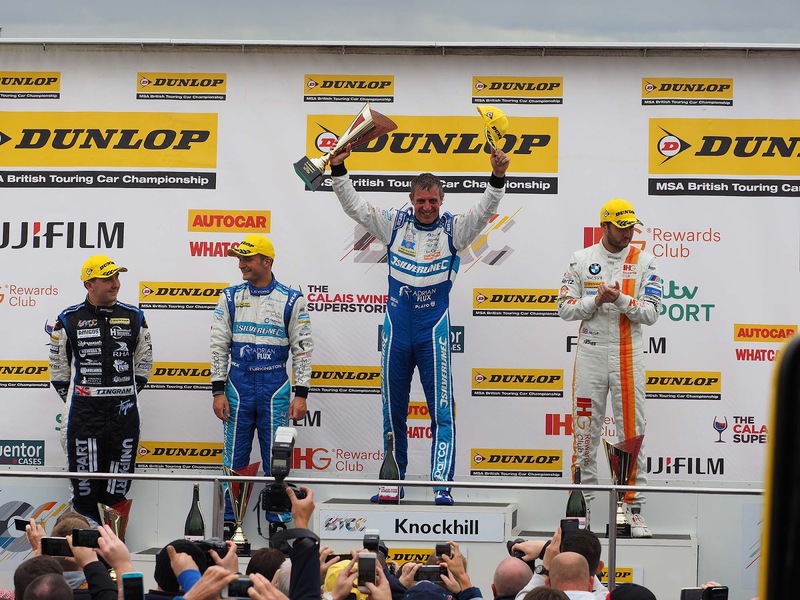 Jason Plato commented: “What a fantastic weekend! “It was great to get back to standing on the top step of the podium especially as it was on such an amazing milestone in my career. I was on Pole and finished second in my first ever BTCC race in 1997 and nineteen years later went one better in my 500th BTCC race with Pole and a Win. 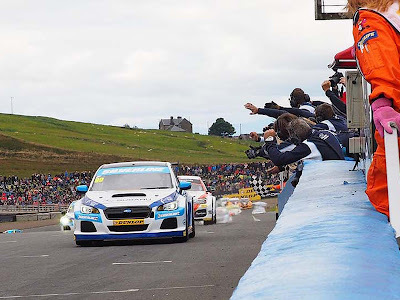 “To leave Knockhill as top points scorer with a first and two third places was a fine reward for all at Silverline Subaru BMR Team, they have worked so so hard. “Race One was pretty straight forward, I nail the start, built up a lead and then controlled the pace, but, the safety car was deployed late in the race which eroded my lead and produced a tense last few laps. “Race Two on the other hand was tense throughout, laden with 75kgs of success ballast I couldn’t breakaway and was under severe pressure throughout the race until I lost rear grip with four laps to go, as it turned out the one of the other cars was laying oil around the circuit and I lost the lead and slipped back to third when Matt Neal rattled inside me at turn seven. Still a good result. “Race Three was all about being patient and letting the race come to me, I was sat in fifth keeping a watchful eye on the leading three starting to get a bit feisty and slightly desperate as Jackson was holding them up. Turkington made a last minute silly lunge on Collard which resulted in him taking both of them out of the race, and nicely promoted me to third. I then got onto the back Tordoff and we both applied serious pressure to the leader Jackson for some eighteen plus laps. Despite all our efforts neither of us could get past the “Slow in the corners, too fast on the straights’’ Jackson. A second third place podium of the day was a great reward. Colin Turkington commented: “I come away from Knockhill focusing on the positives and another strong weekend for the team. We were fast in every session and I was pleased to qualify strongly with championship ballast in the car for the first time. This was the best the car has felt all season in race trim and I was really able to bring the fight to the table. We're moving the Subaru forward at a fantastic rate each time out and considering this was our first time at Knockhill we can all be pretty satisfied. I really enjoyed the intensity of the racing at Knockhill. I had a car that I could push to the limits and there is no better feeling. “I’m confident about the remaining three events and I'm committed to giving my best. We may have lost the points in Race Three but nothing changes – I’m here to challenge for the title." 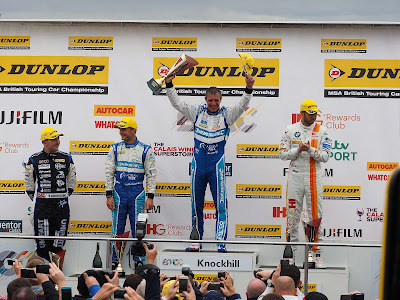 James Cole commented: “Before we get onto my weekend I first want to once again congratulate Jason Plato and Colin Turkington on another mega weekend. “My own weekend was filled with positives and frustrations. The team prepared a perfect car both days. Myself and my engineer, Richard Owen, are now getting into the nitty gritty of the Subaru's performance to best suit my driving style. “Our times in Race One showed real top ten pace, which is where I feel I now should be. Sadly driving standards outside the top ten are in my opinion the worst I've ever seen. A distinct lack of respect between a few of the drivers is really ruining it for most. “It only takes a few to spoil the party. Hopefully we will start to see improvements in the next round as having your own race ruined by the actions of others is tiresome.